Before Brock Lesnar got lazy and decided to sleepwalk his matches, his return to the WWE resulted in some memorable matches. His return match against John Cena ranks higher on the WWE Network’s Best 100…List, but for my money, this match against CM Punk is his best match since he returned. It’s just as brutal as his fight against John Cena, but the story of the match (and the story behind the match) gives every move an extra depth. It’s not just “The Best vs The Beast,” but David vs Goliath inside a square ring. CM Punk had turned babyface in 2013 after his record breaking WWE Title reign was ended by The Rock. Before he turned face, Punk was a “Paul Heyman” guy. Who else was a Paul Heyman guy? The returning Brock Lesnar. Would Paul Heyman have to choose between the two at some point? Not really, but choose he did. At Money in the Bank 2013, Paul Heyman turned on CM Punk. After that, Heyman hid behind the monstrous Brock Lesnar on the path to Summerslam, where “The Beast” would take on “The Best” in a No Disqualifications match. Lesnar’s matches had rarely disappointed since his return. He brought a realism to the ring (thanks to his MMA experience, but mainly thanks to his larger than life look and his devastating moveset) that added extra tension to a match. When an opponent sold Lesnar’s moves, you could never be sure if they were faking it or in real pain. Against someone like Punk, almost half the size of Lesnar, that tension was multiplied. 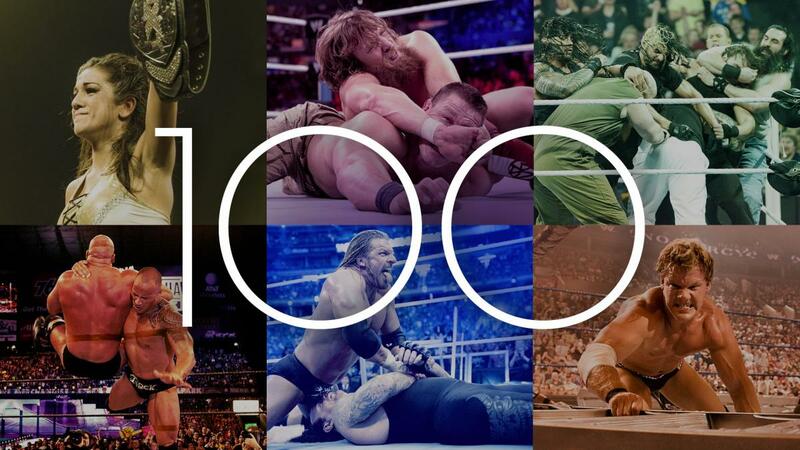 Summerslam 2014 also showcased John Cena vs Daniel Bryan as the main event, which is #55 on the WWE Network 100 Best Matches…List (click here for my review!). However, while that was more a wrestling contest than a brawl, Lesnar and Punk churned out a glorified brawl. It’s simply more excited and gruelling to watch. Punk shows no fear at the beginning of the bout, attempting to fight Lesnar head on, but is roughly tackled into the corner and pounded. Punk launches a high-speed counter attack, leading with a suicide dive. He leaps off every surface to get an advantage over Lesnar. Of course, Lesnar soon comes back. That’s the story of the match, Punk getting a minimal advantage only for Lesnar to quickly cut him down. It makes for a gripping match, all the more so since it’s so easy to root for Punk over Lesnar. Punk’s comebacks are paced wondrously, as are the moments where Lesnar cuts Punk down. The use of chairs is also commendable: they aren’t used to excess, but only to seal Punk’s comebacks towards the end of the match. Punk sells the beating he receives from Lesnar brilliantly, but Lesnar sells just as well. It’s one of the few matches where I thought a bear hug was appropriate and increases the tension, rather than sapped the tension away. Lesnar impresses as much as Punk, not relying on German suplexes to carry a match but holding his own half of the match up. In my reckoning, it’s Lesnar’s last great match since he returned. He’s phoned in his matches since then, and apart from a decent Hell in a Cell match against The Undertaker, Lesnar sits on his pile on cash and laurels rather than trying to create memorable matches. But here, against CM Punk, he delivered a truly great match. Next Article Happy Second Birthday To…My Blog!